For the purpose of the GDPR we are the data controller and any enquiry regarding the collection or processing of your data should be addressed to Sharon Morrison at our address Sharon Morrison Physiotherapy & Associates, 9 Bodington Road, Sutton Coldfield, West Midlands B75 5ET. By using the Website you consent to this policy. We are registered with the Information Commissioner's Office for this purpose. We will collect personal data on this Website only if it is directly provided to us by you the user, e.g. your e-mail address, name, home or work address and telephone number and therefore has been provided by you with your consent. Normally you will only provide such details if you wish to sign up for our free e-newsletter or job applications. We may also obtain sensitive personal data about you if you volunteer it during the completion of an online form. If you volunteer such information, you will be consenting to us processing it. Where you have consented to receive our e-newsletters. If you do not want us to use your data for our use, you will have the opportunity to withhold your consent to this when you provide your details to us on the form on which we collect your data, or you can do so by writing to us at the address detailed above or sending us an email to info@sharonmorrisonphysio.co.uk at any time. If you have given us consent to use your data for a particular purpose you can revoke or vary that consent at any time. If you do not want us to use your data or want to vary the consent that you have provided you can write to us at the address detailed in clause 2 or email us at info@sharonmorrisonphysio.co.uk at any time. Some companies that provide services to us run their services from outside the European Economic Area. We only let that happen if we are satisfied with their levels of security. In the unlikely event that we transfer your personal information to countries that are outside of the European Union we would ensure that the transfer is carried out in a compliant manner and appropriate safeguards are in place. We do not use or disclose sensitive personal data without your explicit consent. You have the right to opt out of our processing your personal data for marketing purposes by contacting us at info@sharonmorrisonphysio.co.uk. We will use technical and organisational measures to safeguard your personal data, for example: we store your personal data on secure servers. The transmission of information via the Internet or email is not completely secure. Although we will do our best to protect your personal data, we cannot guarantee the security of data while you are transmitting it to our site; any such transmission is at your own risk. Once we have received your personal data, we will use strict procedures and security features to try to prevent unauthorised access. The GDPR gives you the right to access information held about you by us. There is no charge for requesting that we provide you with details of the personal data that we hold. We will provide this information within one month of your requesting the data. Please write to us if you wish to request confirmation of what personal information we hold relating to you. 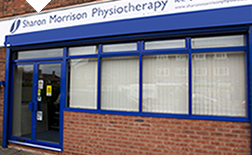 You can write to us at Sharon Morrison Physiotherapy and Associates, 9 Bodington Road, Sutton Coldfield B75 5ET. Proof of your identity will be required to ensure that we are communicating with you (e.g. a certified copy of your driving license or passport). You have the right to require us to correct any inaccuracies in your data free of charge. If you wish to exercise this right you should put your request in writing, confirming proof of your identity and address (e.g. a certified copy of your driving license or passport and recent certified utility bill or redacted financial statement) and specify the information that is incorrect and what it should be replaced with. You have the right to change the permissions that you have given us in relation to how we may use your data. You also have the right to request that we cease using your data or that we delete all personal data records that we hold relating to you. You can exercise these rights at any time by writing to us at the address detailed above, or by email to info@sharonmorrisonphysio.co.uk. There may however be a legitimate reason or legal obligation as to why we cannot remove or delete some of your personal information, however this will be fully explained within our communications with you. We may update these policies irrespective of whether the amendments are due to changes in legislation or for business reasons and reflect changes to the website and customer feedback. Please regularly review these policies to be informed of how we are protecting your personal data.